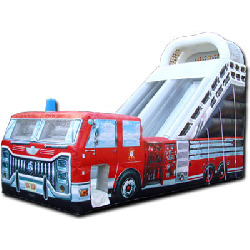 This incredible 22 foot tall slide offers the most realistic impression of a real fire truck to date. Both kids and adults say this is the fastest and most fun inflatable slide they have ever been on. This slide is sure to be a winner at your next event! Don't be fooled by shorter versions of this slide Participants should be no less than 42'' in height to partake on this enjoyable inflatable.